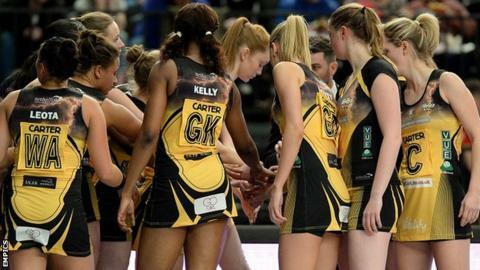 Manchester Thunder kept pace with leaders Hertfordshire Mavericks by beating Loughborough Lightning. Thunder led 30-25 at half-time before running out 61-51 winners, with Jodie Gibson named player of the match. Surrey Storm are three points behind after a 68-53 win at Celtic Dragons, while Team Bath registered their eighth win, beating Team Northumbria 51-41. On Monday, Hertfordshire Mavericks beat Yorkshire Jets, but lost Joline Johansson with a serious knee injury. Both they and Thunder have 30 points, but the Mavericks have a superior goal difference.